As a normal part of their job, Duke Energy archivists Chris Hamrick and Akeem Flavors collect and catalog company artifacts. Most recently, they’ve been collating thousands of bits of trivia for a history exhibit. 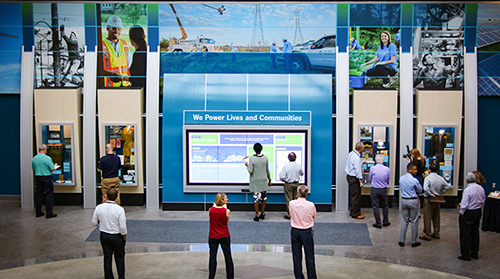 Those tidbits and hundreds more facts, artifacts, photos and videos are included in the new Duke Energy history exhibit in the atrium of the Energy Center, 526 S. Church St. in Charlotte. Although the exhibit is open only to employees during business hours, the public can get a glimpse of Duke Energy and its legacy companies on the “Our History” page and the retro section of illumination. The history page will be updated soon with exhibit content. What’s interesting about an energy company’s history? Duke Energy and its legacy companies are intertwined with the growth and development of the communities they serve in seven states in the South and Midwest. The lakes and rivers you swim or fish in, the lights shining on your street and the company where you work probably are connected to the energy company in your town. Back in 1843, Cincinnati Gas, Light and Coke Co. installed the city’s first streetlights. Nashville Gas Light Co. turned on its first streetlights in 1851. And perhaps most striking, in 1904, Southern Power Co., led by James B. Duke, started harnessing the power of the Catawba River in North Carolina and South Carolina by creating a series of hydroelectric dams to run textile mills. The company’s work over the years transformed much of the Carolinas from an agrarian economy to manufacturing. A giant touchscreen allows users to answer trivia questions, view significant dates in company history and watch photo slideshows and videos. 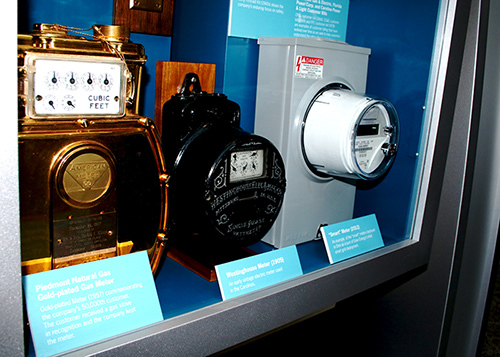 Four display cases hold artifacts, such as an early electric toaster, CEO Bill Lee’s hard hat and a Cincinnati meter reader’s uniform. Some Duke Energy legacy companies didn’t have archives so Hamrick and Flavors are collecting materials. If you have something to donate, contact CorporateArchives@duke-energy.com or 704.382.6166.